CIRCUIT DE SPA-FRANCORCHAMPS is a famous Formula 1 track in Belgium, and this year I, along with two of my Formula 1 enthusiast friends, spend three days watching the race from the the Silver tribune. One spectacular section on the Circuit de Spa-Francorchamps is the Eau Rouge and Raidillon combination. This is a quit left turn in to an unbelievable steep hill that arcs to the right. Preceding this section is a long downhill stretch, making an excellent overview of a great part of the track. This viewable piece of track made it all worth the money for the Silver tribune seat. The F1 racers will blaze past you so close that its almost frightening, and then they continues up the steep hill so fast you just wouldn’t believe it wasn’t a cheap sped-up driving movie, if you didn’t see it with your own eyes. 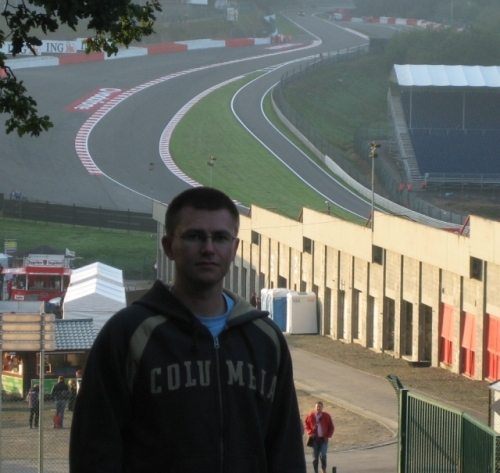 Here I have the Eau Rouge / Raidillon combination in the background. With my Canon IXUS 50 digital camera I recorded a video of a Toro Rosso in the second practice round. This might give some idea of the speed involved (the digital camera is not really suitable for this kind of video recording, so the video quality is not so great). Wikipedia has extensive information on the technical details of Circuit de Spa-Francorchamps track. To be fair then its not all bad. In fact most of the middle and top Silver seats have a great view of the track section. I maneuvered my self to a position behind the top row of seats, and had probably the best view imaginable. All in all it was a great trip and I will probably return there one day for more racing and beer and perhaps some waffles :-).